East Delhi dwellers, no need to make that trip to Noida anymore. Whatever your needs are, EDM mall has them all covered. There's a Big Bazaar, Big Brand Sale and 99 Bazar, where you can find almost everything you'd need in your daily life. 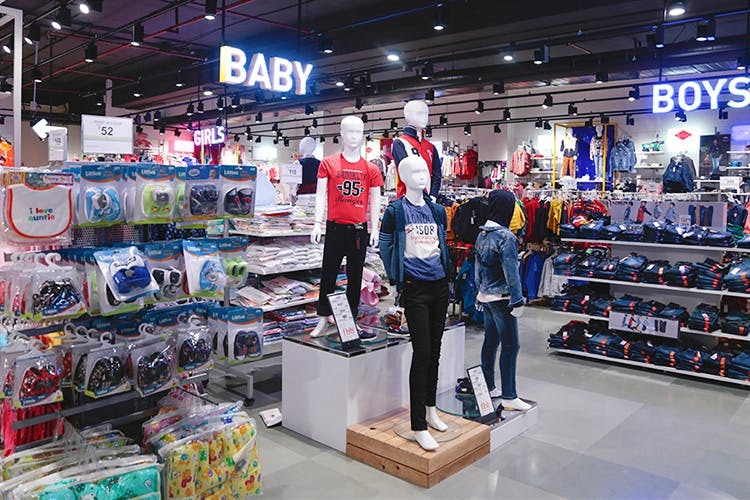 There's also no dearth of clothing stores for men, women or kids from W, UCB, Global Desi and Levi’s to John Players, Reebok and Cutecumber – you’ll find it all. There’s also Pluss for folks looking for plus-sized clothing. For ethnic wear, you can head to Lakshita, Aurelia, Meena Bazaar or Lashkaraa. To get your jewellery fix, check out Arshy Jewellery, J.S. Jewellery and Archies. To keep you entertained, they have a PVR, so you can always hop in and catch a good movie. The place is a joyride for the little ones as well. With a haunted house, a VR centre, a kid’s play zone and outdoor rides, we assure you that no baby will go home bored. Missing a massage? Head to the Lee Thai Spa and Health Club on the second floor to get your dose of pampering. There are also cool salons like Looks and Shahiba to get your grooming needs covered. Most importantly, when hunger pangs strike, you can head to their food court where you’ll find all the usual food stops like McDonalds, Domino’s, Karim’s and Haldiram’s. Although, we do wish that the mall would upgrade on their food options. To be honest, we don't want to throw any hyperbole at you. This mall is pretty basic ones as compared to the other malls in the city. But, it's a good place to chill in East Delhi, especially for those who want to avoid street shopping and stick to the mall experience.